Friday night date-night brought us to the new Open Bottle Bistro in Shadyside on Ellsworth for our first visit. We made reservations on OpenTable, but probably could have just walked right in. We were able to sit on the cute patio off the back of the restaurants where we enjoyed a nice dinner. Our waitress was great and very patient with us. Though she listed off 5-6 special features of the evening, I decided to order from the menu. Most of the specials seemed priced much higher than menu items, which also deterred me from ordering them. Though it was nice to hear the price with each feature as it was read, because not all servers do that. To begin our meal, we shared a Medley of Spreads served with cucumbers and tomatoes. Since the table service also included a refillable bread basket that we also took liberty to refill once. 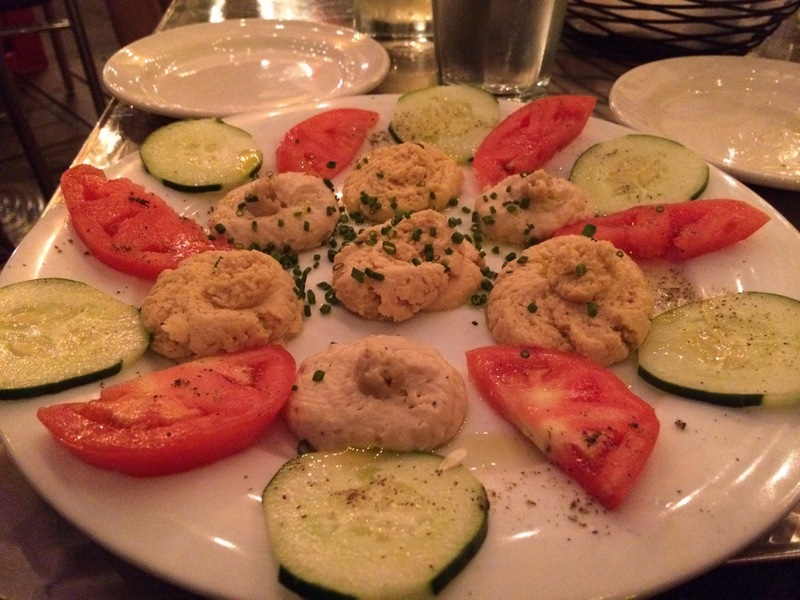 The medley was a white bean pâté , fava bean pâté & hummus – all good. TasteBudA and I each favored different spreads, so it comes down to a matter of texture and preference. I thought the portion of spread you received was great for only $9. 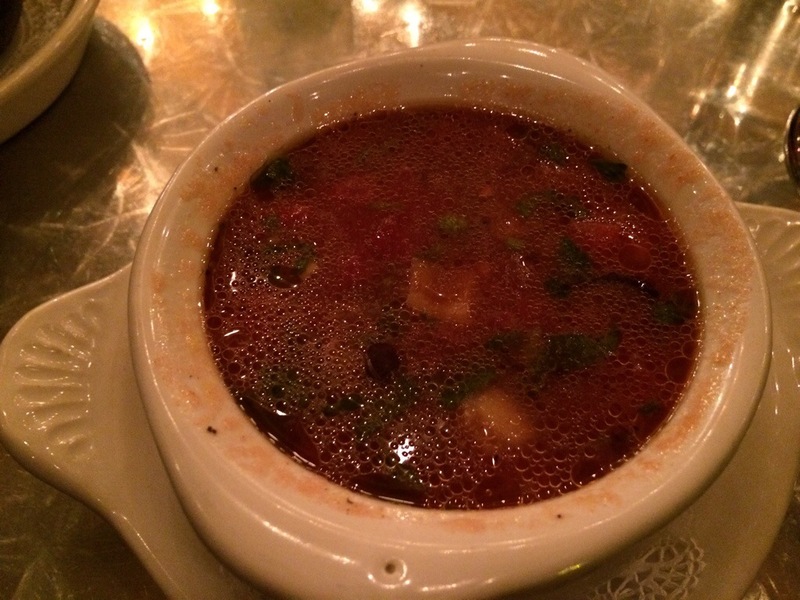 I also ordered one of the Soups of the Day – a gazpacho with some saffron and fresh veggies. It was lightly seasoned and of course served cold. After having more bread than I should have I didn’t finish my soup. It was missing just a little something, but I couldn’t really put my finger on it. I was torn between ordering the Filet Mignon Kabobs or the Steak Tartar of Prime Filet Mignon. 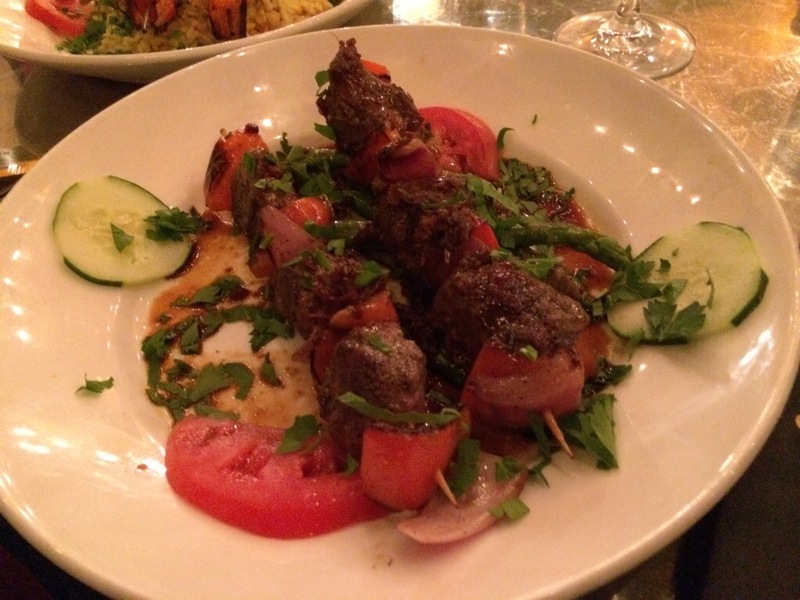 I went with the Filet Mignon Kabobs at the waitress’ suggestion. They come marinated in a Kentuckyaki-sauce, a bourbon infused teriyaki. The kabob was in fact very delicious, though the teryaki didn’t have as strong a bourbon flavor as I was hoping to make it super special. The meat was cooked as ordered and was plentiful on the skewers. I decided to substitute the saffron rice for asparagus. If you look at the photo above, you may miss the asparagus, because the substitution only got me 4 stems. For a $20 entree, I was marginally underwhelmed. Perhaps my substitution was ill-advised. Our service, however, was stellar. Taylor, our waitress was attentive and very pleasant. You could tell that she liked her job and was very knowledgeable about items coming from the kitchen. I would go back, sit in Taylor’s section and certainly give Open Bottle another visit. This visit would probably only get a 3.5/5 for me with most of the credit going to the service and the medley of spreads. Next time, someone else gets to order for me.